Mira was born around the start of the 16th Century in the Chaukari village in Merta, Rajasthan. Her father was Ratan Singh a descendant of Rao Rather, the founder of Jodhpur. When Mirabai was only three years old, a wandering Sadhu came to her family’s home and gave a doll of Sri Krishna to her father. Her father took saw this as a special blessing but was initially unwilling to give it to her daughter, because she felt she would not appreciate it. 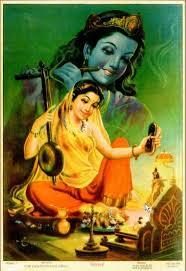 However, Mira had, at first sight, become deeply enamored with this depiction of Lord Krishna. She refused to eat until the doll of Sri Krishna was given to her. To Mira, this figure of Sri Krishna embodied his living presence. She resolved to make Krishna her lifelong friend, lover, and husband. Throughout her turbulent life, she never wavered from her youthful commitment. At an early age, Mira’s father arranged for her to be married to Prince Bhoj Raj, who was the eldest son of Rana Sanga of Chittor. They were an influential Hindu family and the marriage significantly elevated Mira’s social position. However, Mira was not enamored of the luxuries of the palace. She served her husband dutifully, but in the evening she would spend her time in devotion and singing to her beloved Sri Krishna. While singing devotional bhajans, she would frequently lose awareness of the world, entering into states of ecstasy and trance. Mira’s fame spread far and wide, and her devotional bhajans were sung across northern India. In one account, it is said that the fame and spirituality of Mirabai reached the ears of the Moghul Emperor Akbar. Akbar was tremendously powerful, but he was also very interested in different religious paths. The problem was that he and Mirabai’s family were the worst enemies; to visit Mirabai would cause problems for both him and Mirabai. But Akbar was determined to see Mirabai, the Princess – Saint. Disguised in the clothes of beggars, he traveled with Tansen to visit Mirabai. Akbar was so enamored of her soulful music and devotional singing that he placed at her feet a priceless necklace before leaving. However, in the course of time, Akbar’s visit came to the ears of her husband Bhoj Raj. He was furious that a Muslim and his own arch enemy and set eyes upon his wife. He ordered Mirabai to commit suicide by drowning in a river. Mirabai intended to honor her husband’s command, but as she was entering the river, Sri Krishna appeared to her and commanded her to leave for Brindaban where she could worship him in peace. So with a few followers, Mirabai left for Brindaban, where she spent her time in devotion to Sri Krishna. After a while her husband became repentant, feeling that her wife was actually a real saint. Thus he traveled to Brindaban and requested her to return. Mirabai agreed, much to the displeasure of the rest of her family.